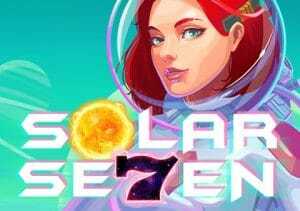 Playtech is inviting video slots players to blast off into space in Solar Se7en, a simple 5 reel, 40 payline game. The highlight of this intergalactic adventure are the re-spins which comes with 2-high stacked wilds. Take off on all devices from between 40p and £500 per spin. Visually, Solar Se7en is an impressive looking game – pastel shades dominate the alien world that forms the backdrop to the reels. Those reels include 4 different alien fruit symbols, each of which pays 40 coins if you land 5 on a line. Next come the mystery triangle, pair of alien creatures and the female astronaut. Land 5 of those symbols and you’ll pocket 80, 100, 150 or 200 coins. Most rewarding of the standard symbols is the black 7 – find 3, 4 or 5 of these on the same payline and you’ll get 50, 100 or 800 coins. Helping to create those winning lines is the bright orange sun which is the wild – it also offers awards of 50, 100 or 800 coins and substitutes for all other symbols bar the spaceship. When 1 of those red spaceship lands, you’ll trigger the game’s only extra, the Supernova Spins feature and be awarded 3 respins. The spaceship turns into a 2-high wild and will appear on the triggering reel for all 3 respins, moving up and down on each. If another spaceship lands on another reel, it too will turn into a 2-high wild and you’ll get another 3 respins. In total, you can play with up to 15 respins. That’s pretty much it as far as features are concerned – expect to see plenty of spaceships fly onto the reels. Land multiples within the same set of respins and the wilds can quickly work their magic to very impressive effect. As we’ve mentioned above, Solar Se7en is a fine-looking video slot and the electro soundtrack matches the futuristic feel rather well. It might not be overflowing in the features department but we rarely found Solar Se7en boring. The respins land often and deliver a steady stream of action. If you’re after cracking design and a simple repetitive feature then Solar Se7en should serve you well – you also have NetEnt’s Starburst which is similar in terms of simplicity and theme.